bloggers, often go awry.” Or so the saying should have gone. It wasn’t until I remembered that The Husband had an evening shift that I realized that my original plan for a blog entry today would not work. It will have to be done this weekend. So I’ve been spending most of my day debating what I should blog about instead… I did not want another cop out post like I gave you yesterday, kittens. That would be cruel. I’m still chugging along on my Honeybee, but have made a fair amount of progress on it today. I reached the double sleeve decreases and have a couple front ones left. The number of stitches on needles are quickly reducing and I can see an actual sleeve shape. I shall be finishing it soon and I’m itching (haha!) to cast on something that I’m more excited about. Shelter. Brooklyn Tweed. The most awesome gray ever, named “Sweatshirt.” It is fab and I’ve been thinking about it constantly since it arrived. This was the second shipment sent to me, since the first was lost. I’ve been vainly hoping ever since that the first would make its way here and I’d have double the sheepy awesomeness, but alas, after 6 weeks, it’s still missing. I’m going to have to accept that it’s not coming. If it would arrive, I had FABULOUS plans for it. Here’s where the problem comes in. I can not decide what to cast on. I’ve been a little MEH about cardigans right now and am itching (haha!²) to do some pullovers. 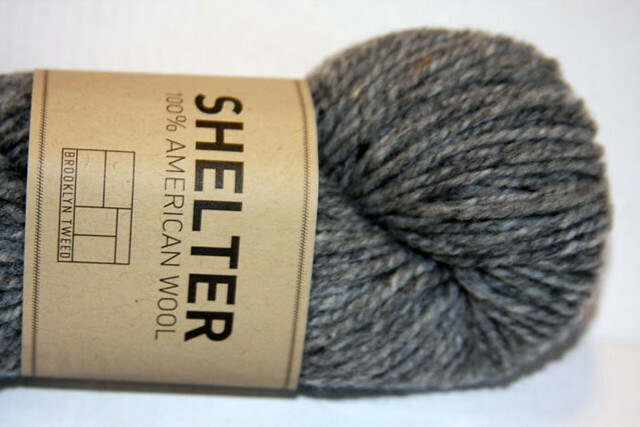 However, this yarn is not merino and has a bit of an itch factor to it. Not terribly bad, but just enough that I would not want it touching more sensitive areas of my body. Garter Yoke Cardigan, Melissa LaBarre. I like the simplicity of the knit and it’s very similar to Mr. Tweed’s own Cobblestone Pullover pattern. So it seems fitting. Heather Raglan Pullover, Cecily Glowik MacDonald. I really like this for the same reasons that I like the last one. It’s simple and would look fantastic in a tweedy gray. As a bonus, no button bands! Then there is the option of free patterns. I’m trying very hard not to purchase additional patterns right now. I’m a collector of them. This is from Coats & Clark, originally written for cotton. But I can definitely see it in gray tweed and it has potential. The simple lace pattern gives it some interest factor and would help prevent boredom while knitting. So what are your opinions, kittens? Any of these strike your fancy for the yarn? The Garter Yoke for sure. I find the bands on the second one a little strange, but that is mostly my weirdness. Love the Garter Yoke! My second choice would be the third one. It is so you!